No longer is the difference between students just a matter of how bright they are, but rather how well their brains’ abilities have been developed. TAC analyses the ability of each person and then customizes a program to develop his or her abilities in the seven major areas of cognition. See the diagram on the left for a list of skills that go into a person’s cognitive profile.The root cause of a student’s consistent learning struggles and frustrations could be a weakness in any of the seven areas of cognition. Through specialized training, TAC develops and strengthens those weaknesses to help “turn on the light switch” of learning and achievement. LoveLoveLOVE what you guys are doing here! My children benefited in extraordinary ways from the Brain Training. I thank the heavens that we found your center! 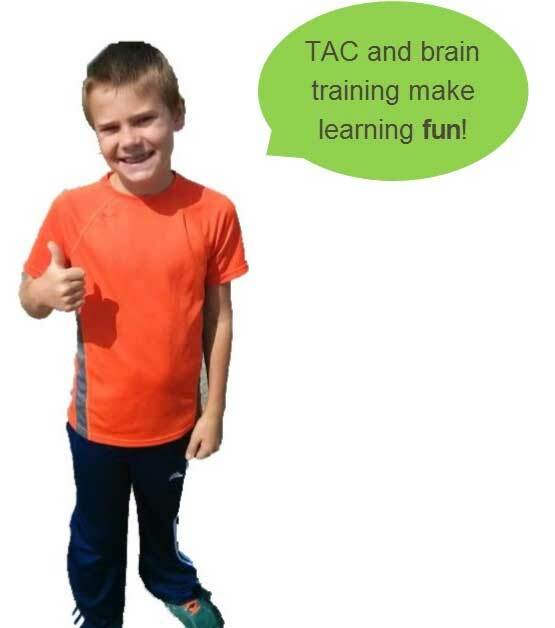 The twins did a full 16 weeks of Brain Training at TAC Center with Johannes Marsland and his certified Brain Trainers. The end results were absolutely astonishing. My son Tanner is already very bright. What he lacked was focus and emotional self-regulation. Johannes promised to work directly with Tanner for the majority of the time. Tanner came away from those four months with strength in both areas that rivaled my own! It was amazing! I’m very proud of his accomplishments. My daughter went in with a whole different set of barriers. She was way behind in reading and math, she wouldn’t spend any time on homework without becoming very angry and resistant, and her self confidence where her intellect was concerned was nonexistent. She was defeated before she even began, she wouldn’t even try. There was concern of a learning disability and/or moderate dyslexia. Johannes’ daughter Aliyah worked with Brooke for almost the whole time. Johannes took time to weed through the learning delay concern. It turns out she just needed some Brain Training! My daughter is like a different child now. She loves to read, loves to do math, does extra math homework ON HER OWN, and has caught up with her class!!! This girl has a brand new enthusiasm for learning. It is so incredible to watch her learn, things just click for her now. If she doesn’t get it she asks questions until she does. Her transformation was nothing short of phenomenal. If you are considering the program, don’t hesitate any longer. Commit to the time, it’s going to pass anyway, you may as well have something significant to show for it. Brooke took away 30 additional IQ points and Tanner took an additional 15! I took away two much happier, well rounded kids! Call 507-721-2500 to learn more!